+5 Attack. If Lunatic Malice causes any damage, the target suffers Blind Lv. 2. Effect 15. Distance (16 Inches). If the attack hits, Deadmoon may make a free second attack against an enemy unit within 2 Inches of the original target. Deadmoon recovers 4 LP. This ability may only be used if a unit within her Control Zone uses a magic ability. A part of Team Lords of the Abyss along with Jerome and Hel. 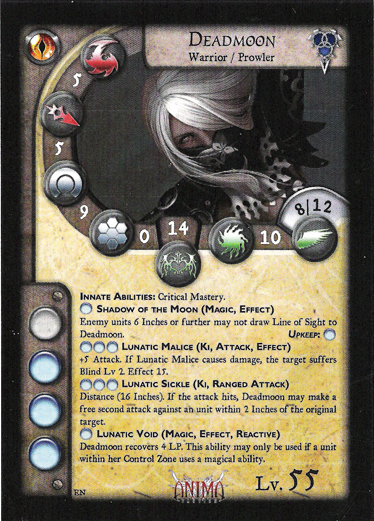 [11/01/2008]If Deadmoon is sealed, both Shadow of the Moon and Zone of Darkness stop working, and their effects dissappear for Jerome and Hel as well. Leader of the Three People in the Abyss, Dead Moon and her comrades are well known in the underworld of Gaïa by their reckless behavior and their unpredictable actions. Former pirate queen, she is now working under the Azur Alliance as free agent, but as she has done her whole life, she does it with her own style. Her powers are as variable and capricious as the moon, but her control over darkness itself is one of her deadliest weapons.